Motorola and Verizon have finally stopped teasing us and have made the Droid X2 official. This is a 4.3-inch Android (2.2, to be upgraded to 2.3) smartphone with a qHD screen resolution and a dual-core 1GHz processor. An 8 megapixel camera with continuous autofocus and HD video recording graces the back. The X2 will cost the usual $200 on contract and will be available to buy online tomorrow, May 19th, before making its way out to stores a week later, on May 26th. Leap past the break for the full PR. Interestingly, we've also spotted the close proximity of the USB and HDMI ports on the side of the new X2. That arrangement is reminiscent of the one on Motorola's Atrix, where the two connectors served to hook that handset up to its laptop and multimedia docks. We don't know whether the Droid X2 will fit into the accessories designed for the Atrix, but it looks sure to be strapping itself into a dock of some description in the near future. Update: NVIDIA has confirmed that its Tegra 2 chip is the heretofore unnamed 1GHz dual-core chip inside the Droid X2, which just happens to be Verizon's first dual-core smartphone. Update 2: A little birdie tells us you may be able to pick up this bad boy in person in some stores as soon as tomorrow (May 19th). Your mileage may vary, but let us know in the comments if you manage to buy one. Update 3: Sure enough, they're on shelves. Matt sent us a pic, which is after the break. BASKING RIDGE, N.J., and LIBERTYVILLE, Ill. – Verizon Wireless and Motorola Mobility, Inc. (NYSE: MMI), today announced the second-generation DROID X2 by Motorola, designed for the consumer who does everything on their smartphone. Fly through the Web with the DROID X2, which boasts Verizon Wireless' first dual-core 1 GHz processor for fast webpage loading and Adobe® Flash® Player, allowing Verizon Wireless customers to experience rich content online. The 4.3-inch scratch-resistant and anti-reflective qHD display delivers a sharp, clear view ideal for watching movies, typing emails and playing your favorite games. Never miss a moment using the 8-megapixel camera with continuous autofocus and stunning HD video capture. Use the new Gallery app to view, tag and post photos on sites like Flickr® and Facebook®, all from one place. · The DROID X2 will be available online at www.verizonwireless.com on May 19 and in Verizon Wireless Communication Stores on May 26 for $199.99 with a new two-year customer agreement. 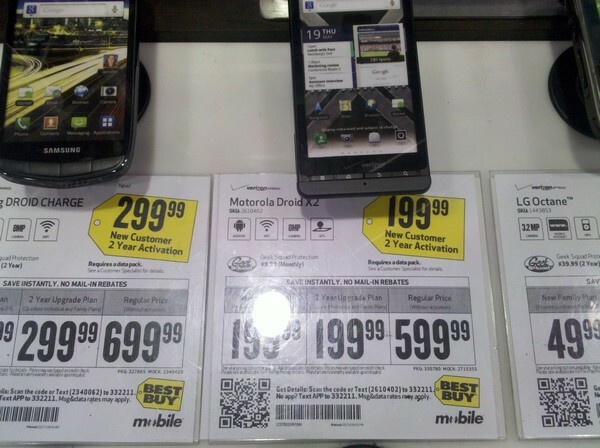 · DROID X2 customers will need to subscribe to a Verizon Wireless Nationwide Talk plan and a smartphone data package. Nationwide Talk plans begin at $39.99 for monthly access and an unlimited smartphone data plan is $29.99 for monthly access.